John G. Saxe’s poem, “The Blind Men and the Elephant,” based on the famous parable, is an example of how the individual perspective can differ from the big picture perspective. In the poem, six blind men seek to learn about an elephant. Since each man gravitates to a different part of the huge animal, they conclude individually that an elephant is like a wall, spear, snake, tree, fan or rope. Saxe concludes that “each was partly in the right and all were in the wrong”. While each man learned about one part of an elephant, they had no idea, individually or collectively, about what an elephant is. If the big picture is the elephant, the blind men missed it entirely. Different versions of the parable have the men arguing over what an elephant is. The parable illustrates the challenge of Communicating the Big Picture, which is Strategy #1 discussed in the on-demand webinar, 4 Communication Strategies for Agile Success. Agile expert Bhavani Krishnan and xScion’s Mason Chaudhry use the example of attending a football game (between the hedges with Mason’s beloved University of Georgia Bulldogs) and how each individual’s view from their seat provides a different perspective than an aerial view of the stadium. Using an Agile approach, large projects are broken down into incremental processes entrusted to small teams that interact with other small teams working on other, related, processes. A foundational element for successful outcomes is a collective understanding and ownership of strategy and vision throughout the organization. Each team should know how it is contributing to the big picture. Without a collective understanding of the big picture there can be conflict, confusion, chaos and delay. There are a variety of approaches that can work well, but the main goal is to use what most effectively communicates the big picture and results in a shared understanding throughout the organization. Each team and individual should know how their outcomes and efforts contribute to achieving the collective vision. Ultimately organizations that have a shared, collective ownership of strategy and vision will see improvements in overall quality and speed in achieving their objectives. 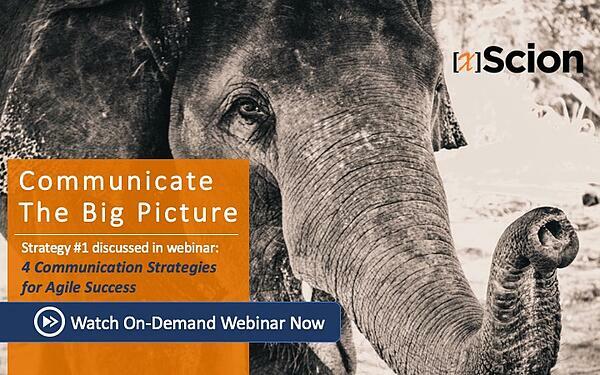 Watch the webinar (available on demand here) to learn more about communicating the big picture and other strategies.